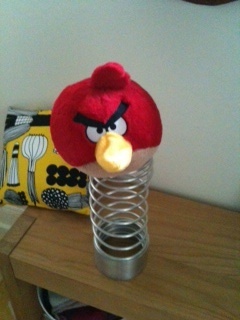 Last night at the Webby awards, two little birds told me some interesting news about Angry Birds. Okay, it was actually a Mighty Eagle, founder Peter Vestebacka, and one of his product managers, Ramine Darabiha. The Angry Birds games now have been downloaded 250 million times across all mobile platforms. So what’s next for Angry Birds? Vestebecka says that they are working on a new game called Wine and Dine and a cookbook which will feature egg recipes. But the most what piqued my ears the most was Angry Birds Magic, a location-based platform which will be built into all Angry Birds games. We’ve already seen a hint of Magic when Rovio showed off an Angry Birds game that unlocked new levels and characters with an NFC-enabled phone. It will also work with Angry Birds stuffed toys which will have NFC chips inside them. But Angry Birds Magic goes way beyond NFC phones (which are by no means mainstream). Magic is a platform that will also be based on location, so that you can unlock new experiences depending on where you are playing Angry Birds. And what about new games that don’t involve birds flinging themselves at objects? Wine And Dine will be more about the pigs, but new games with completely different gameplay (but the same characters) are also in the works.